This beautiful condo is at the waters edge in Poipu Beach situated on the third floor. It has a fantastic, unobstructed view of a beautiful bay and the ocean. Taking full advantage of cooling trade winds, this vacation rental is on the end of the complex, which provides more privacy (no foot traffic walking past the bedroom). You can enjoy the fantastic view from the dining area or living room. 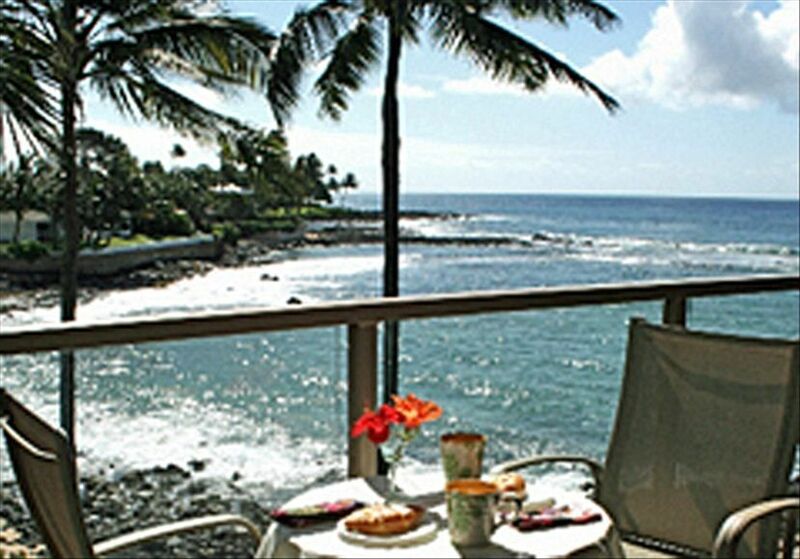 Sit out on the lanai and enjoy snacks or meals or just relax and watch the waves roll in. You can snorkel adjacent to the condo or take a ten minute drive to Poipu Beach State Park which is renowned for some of the best snorkeling in Hawaii. A trip to Waimea Canyon, known as "the Grand Canyon of Kauai" will be a memorable experience. Some of the attractions you can enjoy include a helicopter ride to see the island and fly over the famous and breathtaking Napali Coast and the Waimea Canyon. You can also see the Napali Coast by taking a boat trip or take a zodiac boat excursion to caves along the Napali Coast. Sightseeing at some of the scenic gardens and historic plantations is lots of fun. The National Tropical Botanical Garden is just steps outside the door. These gardens are one of the reasons that Kauai is known as the Garden Island. You will not want to miss the short boat trip to the lush and beautiful Fern Grotto where weddings often take place. You can easily drive to see the Wailua Waterfalls (you may recall these lovely falls from the opening scene of the TV program "Fantasy Island"). If you just want to relax, sit on the condo lanai, and in the cool afternoon shade enjoy the waves rolling in and also watch for turtles and other sea life. I very much enjoy spending time in Hawaii, and especially like Kauai at Poipu. I wake early and sit with my first cup of coffee on the lanai to watch the sun rise over the bay. I love the early morning and always plan to walk along the water. It is peaceful and quiet. The scent of the flowers fills the air as the day is awakening. A short walk brings me to the National Botanical Gardens and then to Spouting Hole just beyond. By the time I return the boats of fishing enthusiasts and snorkelers are beginning to make their journey into open waters, sun bathers are finding the perfect spot on the beach, and I am looking forward to my day of exploring Paradise. You absolutely can't beat the location if you're planning on staying on Kauai's sunnier South Shore. The condo is located next door to the popular Beach House Restaurant, which we quickly learned is THE place to be each evening to watch the most spectacular sunsets you've ever seen. You can order a drink from Beach House and enjoy it on their enclosed area of the lawn, or make your own drink and take a seat on the condo's grassy side with your new neighbors. As a bonus, you'll enjoy watching the weddings taking place at the restaurant (4 out of the 7 nights we were there!) and surfers going back in for one more wave. When I think about the views from the Greuliches condo, I'm almost moved to tears when I remember walking in for the first time and seeing the view. This condo is located in the corner of the third floor (there are both stairs and an elevator - we took the stairs when we'd eaten too much spam musubi! ), which means you sit at the perfect position to enjoy incredible vistas immediately below of blue ocean and gently rolling waves as far as the eye can see. We woke up just before sunrise each morning to take in the view - you're treated to some truly spectacular sunrises from the comfort of your private lanai and living room here. We were pleasantly surprised to discover a very comfortable bed and pillows on the queen bed in the bedroom. We kept the windows open slightly each night to hear the soothing sounds of the island. To say we had blissful, restful sleep would be an understatement! The rest of the condo is very neatly appointed with tasteful island-themed decor. It looks and feels like somewhere a happy family would stay. We loved it! It was such a treat to discover beach chairs, towels and a cooler in the living room by the bookcase. We made good use of all of them! In the bathroom, there is a hair dryer and other hair tools. There are also oodles of books, including guides of the island, a puzzle, movies, and more. We loved staying here and will definitely be back! Mahalo nui loa! Well appointed ocean front one bedroom, close to the island main attractions, to gorgeous beaches to shopping to the airport. The condo has all the needs for a comfortable stay, even air conditioning. Thank you for the wonderful review. We're so glad you enjoyed the property and surrounding area. It is such a beautiful and relaxing area. We hope you will consider us again on you next adventure to Kauai. After 3 years of Hip, knee and shoulder operations we wanted a nice relaxing time in beautiful Kauai with a little snorkeling. We wanted a one bedroom nice clean simple condo with a ocean view. We wanted to have our coffee in the morning and wine in the evening looking at and listening to the ocean. Could not have been better! PS: a bonus was its location which made getting to our favorite sites and restaurants a breeze. Loved the lanai and being able to go around the back, too. Enjoyed my stay! We were at a hotel that had a couple issues so we moved here last minute. The condo had everything we needed. It was very clean. It is a basic unit, and on the end. We saw the street and cars, but with the ocean and bay so close, we didn't hear them. The bed is very comfortable. We loved sitting on the lawn and watching the turtles and surfers. The condo has beach chairs and a cooler we used everyday. The new air conditioners were wonderful. The unit is not updated, but it was a great home base and value for the money, and close to everywhere we wanted to be on the south end of the island. We are so glad it all worked out and your stay on Kauai was relaxing. We appreciate your review and are working on our next project, which is updating the condo and the furnishings. We just recently added the air-conditioning and the response has been great. We hope you will consider us the next time you vacation on Kauai. Beautiful View. Comfortable Bed. Great Location.